For the last time, readers, if you are going to get a tattoo, make sure someone proofreads the text before you get inked. Perhaps the tattooed dude was so upset about the punctuation errors and misspellings on his arm that he wrote the following message for the tattoo artist. That's a little bit creepy! I wouldn't dare correct that guy's punctuation. 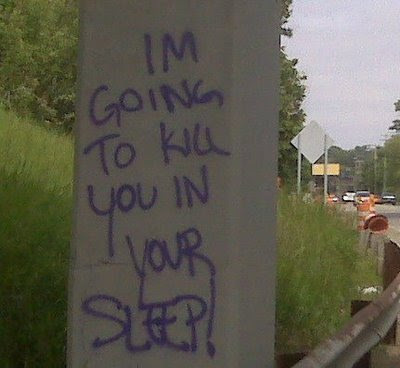 Um, dude, if you're reading this blog, your graffiti looks lovely! IM doesn't need an apostrophe! Thanks to Matthew for sending in these disturbing images. 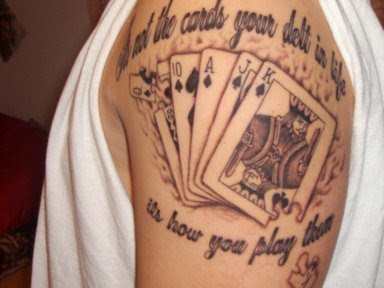 Too bad -- the art work looks fantastic on that tattoo! With all the time and effort involved in designing it, they could have at least taken the time to proof it. Living with these permanent errors is pure horkloi. This is why I don't use IM anymore; it will kill me in my sleep. Twitter is far preferable. I'd wager it wouldn't matter what cards that berk was 'delt', he'd play them badly. Huh? What's this about Instant Messaging is going to kill me in my sleep or something??? So scary! A Farmers' Market for Farmer's?